Ever wondered why some content marketing programs are more successful than others? Does it come down to execution, strategy, timing, or any other contributing factors to success? Whether you’re new to content marketing or knee deep in your brand’s content marketing program, answer these seven questions. If you have or can come up with good answers, chances are you’re going to have better success with your content marketing program. 1. Is there a clear business problem you’re solving? The best content marketing programs address a clearly defined problem or challenge. Why? It brings clarity to the reason you’re using content marketing in the first place. Without a well-defined purpose for content marketing, the team lacks focus and team members fill in the gaps with their own agenda, ideas, or content. The sales cycle lasts six to 12 months. Your brand needs to stay top of mind with your prospects. Prospects for your type of product are not aware of your brand. Your customers have heard of you but don’t really understand how your brand can help solve their pain points. 2. Do you have a clear definition of success? Is everyone aligned? Did you ever notice that marketers usually show four to seven metrics when talking about measuring their programs? Why is that? First, marketers, particularly those who work for big companies, think if they identify multiple metrics, it’s easier to get consensus around a program. Second, by listing more metrics, marketers think it increases the content marketing program’s chance of success. For example, “Hey, we hit three out of our five metrics, not too shabby right?” And sadly, the third reason is marketers select several metrics just because it’s possible to collect them. To have more success with content marketing, choose one or two metrics. Is it easy to narrow down measurement to a couple items? No. Will it focus your content marketing program? Absolutely. If your team members understand that success is assessed by one or two metrics they can focus all their efforts on achieving those goals. Even though it takes more time to agree on what those fewer success metrics will be, it should pay off in the long run. Also, related to your program metrics, make sure engagement isn’t listed as a desired outcome. Why? Because engagement isn’t a success metric. Yes, engagement is a good thing and usually leads to other positive things. But remember, engagement is a diagnostic look at how people consume your content. Think about what next (or final) action is most beneficial for your business. 3. Do you have the right tools? If you’re getting into the content marketing game, you need the right tools to deliver and track your content to make sure you reach your audience. A word of caution about tools: Don’t get lost in the hunt for the perfect tool. It doesn’t exist. If you’re new to the martech space, get advice from someone who’s been there. Focus on the tools you need, not the ones you want. Your budget and implementation timing will guide most of your decisions. 4. Do you have the right team? What’s the overall story you want to tell? Are people finding your content useful? What topics are important to your audience? What should you write about those topics that’s relevant to your audience and your business goals? What form will the content be delivered in? What’s the best way to share the information? What do you want the audience to feel as they read your content? How did your content perform? How can the content be improved for better performance? How are people finding your content? What’s the business impact of your content? 5. Does the customer drive your editorial calendar? Historically, marketing determined what messages were most important. Modern content marketers know the best approach is influenced and sometimes even dictated by your audience. Why would you consider giving up so much control on your content? It’s simple. Your content should fill a need. And there’s no better way to understand your customers’ needs than to ask them what they need help with. 6. Do you own your audience? Would you rather own or rent your outreach list? That’s the defining question when it comes to thinking through your primary content distribution strategy. Obviously, it’s better to own your list because you don’t want to be handcuffed to rule changes or algorithm tweaks by advertising or social media platforms. By owning your audience’s email addresses, you can reach them directly and you can better track your ongoing content interactions. However, renting – promoting content on social media, working with third-party lists, etc. – is likely still necessary to start or grow your owned list. 7. Does your brand have the determination and patience? I’ve saved the most important question for last. Content marketing isn’t a whim. It’s challenging. It requires a long-term commitment. Sure, you may see some success in your first couple months. However, don’t expect anything big, and certainly don’t promise anything you can’t deliver. If you’re leading a content marketing program, getting your leadership to understand that it takes time to show results will be paramount to your success. Set aggressive but doable goals. Another thing is that the content creation process isn’t easy. You need people on your team who are curious, forward-thinking, and who can overcome obstacles. Spend the time to find the right team. How did you do on this quiz? Is your content marketing program in good shape? Are there elements you already knew were important but have let slip for a variety of reasons? 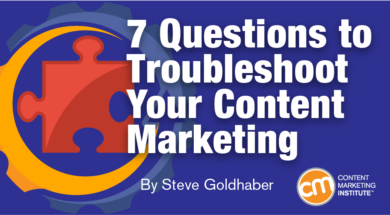 Let these seven questions be your go-to check-in every six months or so to ensure that your content marketing program continues to have the necessary elements for success. Get daily weekday reminders and tips to make your content marketing program even better. Subscribe to the free CMI newsletter. Steve Goldhaber is the Founder & CEO of 26 Characters, a B2B content marketing collective. Prior to starting 26 Characters, Steve was in charge of global digital and content marketing for two Fortune 500 companies. He has 20+ years’ experience in marketing. You can reach out and start a conversation with him on LinkedIn or follow him on Twitter @goldhaber.